Hagar Qim, the world heritage site, is being dwarfed by the government’s ‘visitors’ centre’ which should have been built in the Maghlaq quarry in the vicinity of Mnajdra, and not in the car park next to the Hagar Qim temples, MEPA’s own heritage watchdog emphatically stated before the permit was amended in April. But now anyone visiting the temples can be expected to be taken aback by the scale of the new building that will host the visitor centre. The committee also asked MEPA to seek the approval of world heritage organisation UNESCO, which designated Hagar Qim a world heritage site. The CHAC first registered its objection in July 2005 when it “unanimously” agreed that the proposed Visitor’s Centre should be sited within the Maghlaq quarry instead of the current parking area. A spokesperson for Heritage Malta, the national watchdog, confirmed to MaltaToday that the quarries were considered as a possible location. In fact the brief for the international design competition for the visitor centre had specified two buildings, not one: a much larger one in the quarries, and one at the location of visitor centre being built which was even larger than the present one. But the competition jury insisted it would be economically more feasible to build the Visitor Center in just one place. The same committee concluded that “the ideal place for all these premises seems to be the existing parking area below the restaurant”, because it was not visible from the seaside and did not impinge on the surrounding landscape facing the sea and Filfla island. 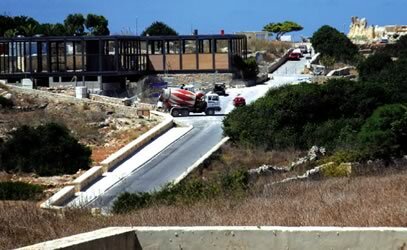 According to Heritage Malta’s spokesperson, the creation of a visitor centre in the quarries would also require the creation of a new access road through the quarries, and a new parking area, which present considerable engineering difficulties. This would have required a budget four times that available without counting “the claims for compensation by former quarry owners/operators.” This would have also resulted in a “direct conflict between a visitor facility and a landfill/inert waste site” in the vicinity. The new visitors’ centre will include an auditorium for an audio-visual introduction and an exhibition space, displaying related artefacts that are currently at the museum of archaeology.